Carpets, seats, cushions. We can recover and rebuild your stock seats with new foam as well as carpeting your boat. From repairing your seat to customizing it. Gelpads, leather and exotic leathers, plus ergonomically reshaping the seat to you and your bike. We can repair and/or recover your golf cart seats and we can replace any rubber or carpet in your cart. From repairing seat frames, seat panels or completely recovering your seat as original, let us help. 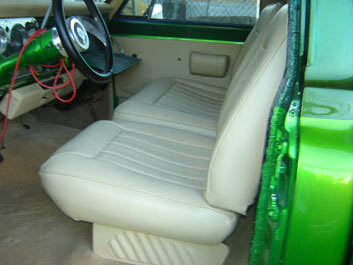 Thinking about customizing your seats as well as your interior? We offer vinyl, cloth, suede and leather. We also can replace your old, sagging or torn headliners. Do you have favorite pieces of furniture with stains, holes or that just need to be recovered? How about your grandma's vintage recliner? Consider repairing and/or recovering that, as well as any of your other furniture. We also construct custom headboards for any style bed. 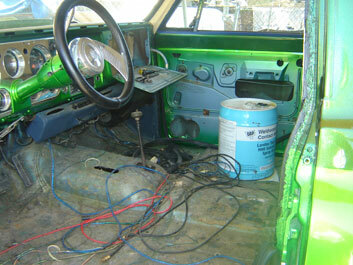 We can do just about anything from a repair to a complete job. Give us a call so we can help you.